We may spell it differently, but there’s one thing we have in common: we put on a hell of a show. If you’re visiting London and want to visit the West End, you’ll not just have to brush up on your vocab, you’ll need to know how to buy tickets, where to go and what else there is to do while you’re here. So, because we like being helpful, here’s your guide to London theater. No matter how great the performance or how catchy the tune, London theater is all about polite clapping… until the end of the show. Then we go nuts. So even if you know all the words or you’ve travelled halfway across the words to see a particular performer, be reminded of the quintessential British stiff upper lip. After the curtains go down at the end of that first act and you’ve made a b-line for the toilets, you’ll want to hit the snacks. Every London theater will offer a selection of ice creams – a delicious, silent treat – and a variety of chocolates and sweets. But there is a programme. So if you want to have a souvenir at the end of the night, you’ll have to shell out a bit of cash. Unlike Broadway, the West End covers most of London. There are West End theaters everywhere from Holborn to Victoria, Waterloo to Covent Garden. So don’t expect a single road with all those glittering lights. Plan your Theatreland trip or just take a tour around the city to see all of our beautiful venues. Unlike on Broadway, opening night in the West End is all about press. There will be some stars and a lot of journalists and though you can sometimes buy tickets to be there on opening night, it’ll be a whole different experience to one on Broadway. Booking tickets to a London theater show is super easy. You can visit the venues in person, or just visit the Official London Theatre ticketing page where you’ll find loads of brilliant West End musicals, plays, operas and dance shows. If you’re looking for tickets to Hamilton or Harry Potter And The Cursed Child, it’s a little more complicated. Both run lotteries which give you the chance to book tickets to upcoming performances, or you can book far in advance. If you were banking on the Hamilton lottery but haven’t been lucky enough to win, don’t despair. You can still see a brilliant West End show. 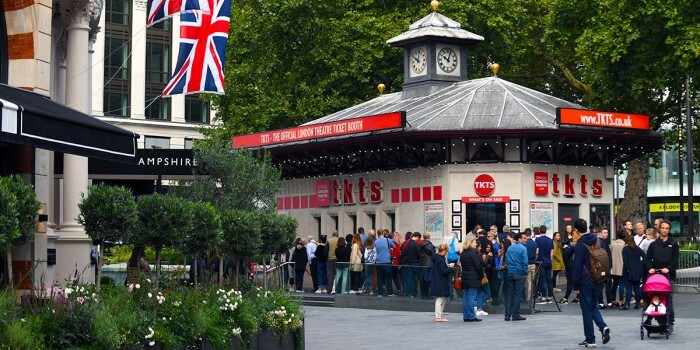 You may not be able to buy last-minute tickets to Hamilton or Harry Potter And The Cursed Child, but you can save up to 50% on tickets for shows happening that night from the TKTS booth in Leicester Square. So, London’s really old. Like, really, really old. So the roads don’t follow any sort of logic. There are no blocks. No straight lines. Just a lot of squiggles around ornate buildings. But, if you have a map, finding your way around is super easy. And we’re here to help. We’ve handily created pages with directions, maps and any other information you need to know for all of London’s theaters. Find the London theater you’re looking for, here. London’s West End is full of restaurants, cafés and coffee shops. There are plenty of places that serve pre- and post-theater meals. And, many will give you offers if you have a theater ticket. Find a venue that will have a menu and offer to suit your taste, here. There is so much to do in and around the West End. From the free museums and galleries – like the British Museum, National Gallery, Museum Of London, Imperial War Museum, and Tate Modern – to Buckingham Palace, you can easily see the sites and a show in one day. Coming to London? Find the perfect show for you, here.